Yellow Vest protests in Paris descended into violence on Saturday, with demonstrators looting shops on the Champs-Elysées Avenue and 'ransacking' the famous restaurant Le Fouquet. By lunchtime, up to 8,000 people were demonstrating in central Paris, according to Interior Ministry figures. Of that number, some 1,500 were “ultraviolent” individuals whose aim was to cause destruction and to fight, Interior Minister Christophe Castaner said. Police arrested dozens of protesters and fired tear gas and water cannon in front of the Arc de Triomphe, the scene of angry protests in December. 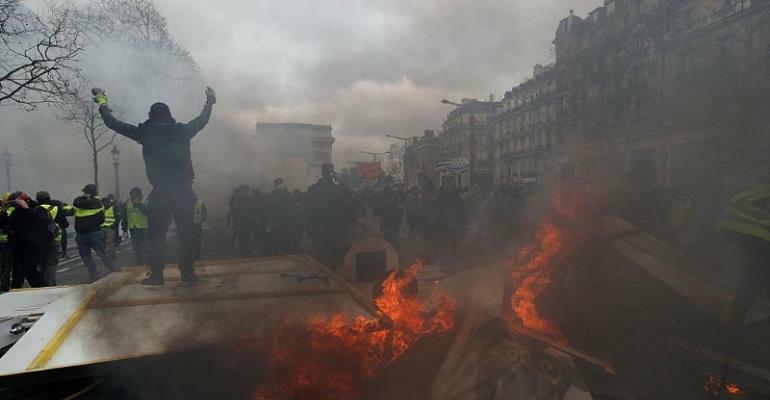 Media reports say the Yellow Vests started bonfires, set cars alight and threw cobblestones at police as they sought to drum up new momentum for their four-month-old revolt against President Emmanuel Macron and his pro-business reforms. Shops belonging to several luxury brands were damaged, among them Hugo Boss and Nespresso. The 18th Yellow Vest protest comes a day after France wrapped up two months of national debate on the country's social and economic problems. Turnout for the weekly demonstrations, held in cities across France, has been getting smaller since December, when they were overshadowed by looting and vandalism. Castaner blamed Saturday's violence on troublemakers who infiltrated the demonstrations, and he ordered police to respond to the attacks with “the greatest firmness". In a tweet, Castaner said: “Let there be no doubt: they are looking for violence and are there to sow chaos in Paris." There have been accusations of police brutality in past Yellow Vest protests.